Hayek (1945) predicts that where local information is important, the organization of production should be decentralized. This prediction is tested and supported in the context of the decentralization of Chinese state-owned enterprises (SOEs). SOEs are more likely to decentralize with increasing distance from the seat of the oversight government. This likelihood is especially strong when performance heterogeneity is greater and/or transportation costs are higher. One of the most dramatic economic events in the 20th century was the world-wide emergence, sustained expansion, and then rapid decline of planned economies and state-ownership. Between the end of World War II and the collapse of the Soviet Union, it appeared that an economic system based on planning could be as productive as, if not more productive than, the market system. In the 1973 edition of Economics, Samuelson stated that the Soviet Union’s per capita income level would match that of the United States by 1990. However, there were detractors of this notion from the start. The debate over the merits of market socialism in the first half of the last century involved influential economists such as Oscar Lange, Abba Lerner, Ludwig von Mises, and Friedrich Hayek; the debate has even continued into recent decades. The key arguments for why a market economy is more efficient than a planned economy are that there are stronger incentives for more secure protection of private property rights and that there is an efficiency in using local information dispersed among individuals and plants (Boettke, 2005). This second point originates from Hayek (1945), one of the most cited economics papers of all time. The critical importance of incentives, ownership, and property rights for explaining performance in socialist and transitional economies is one of the most active areas of research (Megginson and Netter, 2001). However, the importance of local information for the management of state-owned enterprises was not empirically explored until Huang, Li, Ma, and Xu (2017). Huang, Li, Ma, and Xu (2017) examine the causes of the decentralization of state-owned enterprises (SOEs) in China, focusing on the role of local information. We rely on the Annual Survey of Industrial Firms (ASIF) 1998-2007, which covers all SOEs. In our empirical implementation, decentralization is defined as the oversight status of an SOE shifting from a higher-level to a lower-level government. The availability of local information is captured by the physical distance between an SOE and the oversight government. Consistent with the recent literature, a larger distance implies that the government has fewer direct observations on firm-specific information. Indeed, most governments of the world have engaged in controlling these commanding heights since the end of World War II (Yergin and Stanislaw, 1999). Strong state intervention in Western economies started with the UK Attlee Labor government in 1945, which promoted government planning and the nationalization of industries. The General de Gaulle government in France followed suit, declaring that the state “must hold the levers of command.” Similarly, after the independence of India, Prime Minister Nehru often evoked the commanding heights metaphor. Typically, these countries, as well as Germany, Korea, Japan, many Latin American countries, and all socialist countries, had strong state control/ownership over strategic sectors such as defense, iron and steel, railroads, ship-building, utilities, and telecom. In sectors like these, the key consideration for decentralization is likely not to utilize local information but to ensure the benefits of “strategic control.” Thus, the commanding heights conjecture posits that in the key sectors under the oversight of the central government, the link between decentralization and the distance between the firm and government should be weaker. We find strong support for the above conjectures. 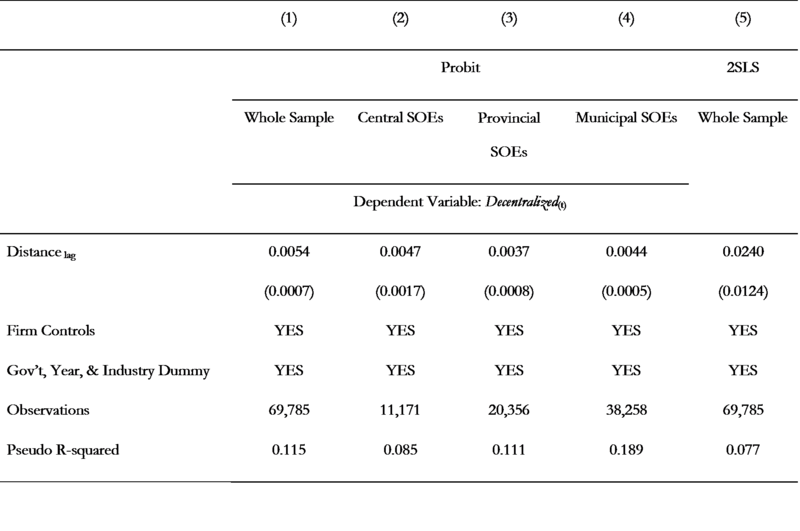 Consistent with Hayek (1945), the larger the SOE-to-oversight-government distance, the more likely the SOE is decentralized [see Columns (1) to (4) of Table 1]. Moreover, the positive distance-decentralization link is stronger with greater firm-performance heterogeneity (as captured by the variability of performance within an industry) and with higher communication costs (as proxied by road density). Consistent with the commanding heights conjecture, for central SOEs in strategic industries (as defined by government decrees and top officials’ speeches), the distance-decentralization relationship is muted. This strategic segment is neither trivial nor large, making up about five percent of the total value added of all sample industrial firms. Note: Standard errors clustered at the central government level are reported in parentheses. To ensure a correct interpretation for the distance-decentralization link, we conduct several checks. To exclude the possibility that distance to the government serves as a proxy of the distance to an agglomeration center, we construct a placebo distance to the alternative agglomeration city and do not find this measure to be correlated with decentralization. To address the potential endogeneity concerning distance, we rely on exogenous sources of variation of the distance to identify its effect on decentralization. In the 1960s and 1970s, many SOEs were relocated to China’s inland areas in anticipation of wars with the U.S. and the U.S.S.R. As a result, their distances to oversight governments were historically determined and had nothing to do with the decentralization decisions made decades later. The instrumental variable results [see Column (5) of Table 1] are qualitatively similar to those in our base specification. We also consider two alternative hypotheses on decentralization. The first is the oversight agency conjecture, which posits that decentralization originates from considerations of rent-seeking by the oversight government. The second alternative hypothesis is the local capture conjecture, which posits that decentralization is determined by lower governments’ lobbying. We find that the Hayek conjecture has the best prediction power among all alternative hypotheses. To summarize, as the quote from Hayek suggests, when a society experiences rapid changes, the ultimate decisions should be left to those familiar with the particular circumstances and “some form of decentralization” is needed. Our findings suggest that Hayek’s insight on local information is indeed a key for understanding the organization of firms in general and economic systems in particular. Our findings also suggest that when the central government decides to control the commanding heights, the Hayek conjecture loses much of its explanatory power. The Chinese experience of managing its SOEs thus demonstrates the dual goals of the government: efficiency and controlling commanding heights. Hayek’s insight and the evidence in this paper do have implications for some of the recent debates on whether big data could make planning more efficient and superior, a viewpoint that Ma Yun, the Chinese internet billionaire, famously holds. The availability of big data simply cannot solve the issue of “local information,” which encompasses the preferences of individuals, personal information on local shocks and innovations, personal epiphanies, and ideas, among others. Equally non-trivial are non-rational behavior biases discussed by Tversy and Kahneman (1974). These considerations simply cannot become part of big data yet. Moreover, even though computing power has become super-cheap over time, the collection and analyses of big data remains expensive and may potentially pose a serious threat to individual liberty and privacy, as the recent controversy about the Facebook data breach demonstrates. Hayek did not mention, but was surely aware of the fact that planners would encounter incentive problems and agency costs as well. Acemoglu, Daron, Philippe Aghion, Claire Lelarge, John Van Reenen, and Fabrizio Zilibotti. 2007. “Technology, Information, and the Decentralization of the Firm.” Quarterly Journal of Economics 122(4): 1759-1799. https://economics.mit.edu/files/4475. Bloom, Nicholas, Luis Garicano, Raffaella Sadum, and John Van Reenen. 2014. “The Distinct Effects of Information Technology and Communication Technology on Firm Organization.” Management Science 60(12): 2859-2885. https://pubsonline.informs.org/doi/abs/10.1287/mnsc.2014.2013?journalCode=mnsc. Boettke, Peter. 2005. “Hayek and Market Socialism: Science, Ideology, and Public Policy.” Economic Affairs 25(4): 54-60. https://onlinelibrary.wiley.com/doi/abs/10.1111/j.1468-0270.2005.00592.x. Garicano, Luis. 2000. “Hierarchies and the Organization of Knowledge in Production.” Journal of Political Economy 108(5): 874-904. https://www.journals.uchicago.edu/doi/abs/10.1086/317671. Hayek, Friedrich. 1945. “The Use of Knowledge in Society.” American Economic Review 35(4): 519-530. https://www.kysq.org/docs/Hayek_45.pdf. Huang, Zhangkai, Lixing Li, Guangrong Ma, L. Colin Xu. 2017. “Hayek, Local Information, and Commanding Heights: Decentralizing State-Owned Enterprises.” American Economic Review 107(8), 2455-2478. Link to a working paper version: https://papers.ssrn.com/sol3/papers.cfm?abstract_id=2918443. Megginson, William L., and Jeffry M. Netter. 2001. “From State to Market: A Survey of Empirical Studies on Privatization.” Journal of Economic Literature 39: 321-389. https://www.oecd.org/daf/ca/corporategovernanceofstate-ownedenterprises/1929649.pdf. Tversky, Amos, and Daniel Kahneman. 1974. “Judgment under Uncertainty: Heuristics and Biases.” Science 185 (4157), 1124-1131. http://psiexp.ss.uci.edu/research/teaching/Tversky_Kahneman_1974.pdf. Yergin, Daniel, and Joseph Stanislaw. 1999. The Commanding Heights. New York, NY: Simon and Schuster, Inc. https://www.amazon.com/Commanding-Heights-Battle-World-Economy/dp/068483569X.